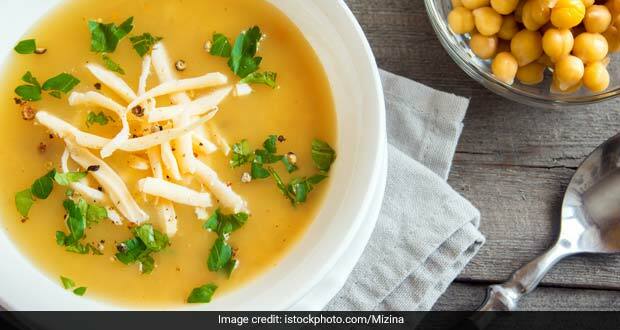 About Chickpea Soup Recipe | Soup Recipe: Chickpea soup enhanced with leeks, celery, zucchini, squash, bell peppers and white wine flavours. 1.In a hot pan add the leeks, celery, onions, garlic, chives, rosemary, thyme and sage. 2.Add the chopped zucchini, squash, and bell peppers. 3.Add some red chilli flakes, white wine, chickpeas and the chickpea stock. 4.Stir and bring to a boil. 5.After the soup boils let it simmer for a few minutes and then blitz it. 6.While the soup is simmering you can sauté the leftover chickpeas, bell peppers, zucchini and yellow squash in olive oil as topping.